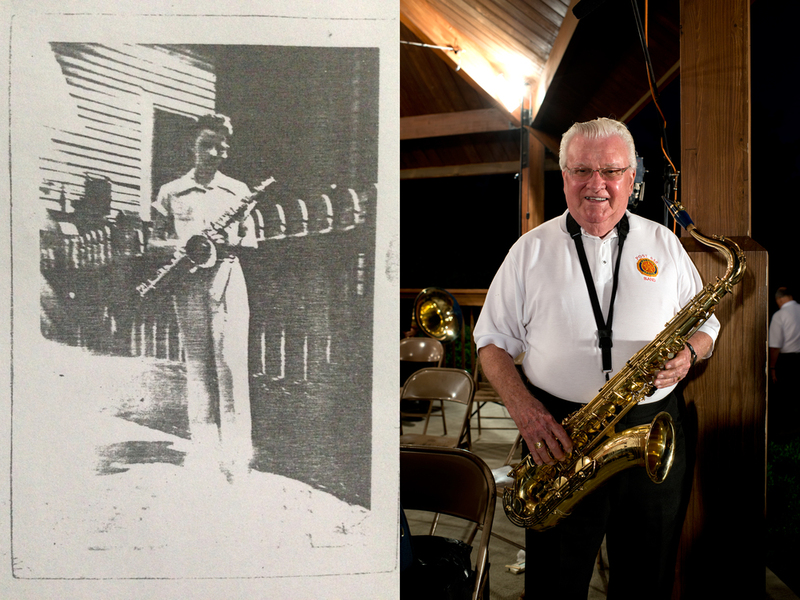 My grandpa, at the age of 82 years old, still plays his saxophone in a concert band and dance band performing medleys and big band hits. I can remember as far back as when I was 4 years old going to big band concerts at a local amphitheater here in Cincinnati. Since then I've been in love with the Glenn Miller era of the 1940s, be it history, fashion style or music. I'm in love with it all. Below is a diptych I put together of a photograph taken of my grandpa in 1944 in the Irish Channel of New Orleans when he was 13 years. Beside it is a portrait I took of him tonight at the Post 530 American Legion Concert Band event. They played scores of marching music from the 1930s and 40s for the Navy, Army and Marine Corps. World War 2 Veterans who were at the concert tonight stood up when the score for the branch they served in was played. Talk about a humbling experience! I had tears in my eyes as the elderly vets stood up and clapped along to the music. An honest experience that kids in the youngest generation need to experience. They have no idea how great of a generation that this group of people is.